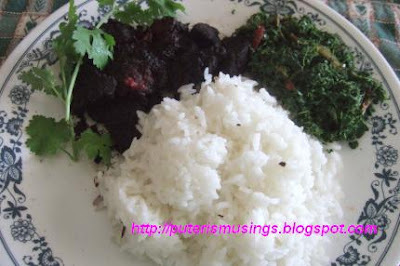 Beef masak hitam (last night's leftover) and daun ubi for my lunch today. This morning I went to the Galt Market and found some young tapioca leaves (daun ubi). I must have not paid much attention to the vegetables sold at the market because before this I had never noticed daun ubi being sold there. It was by chance that I saw the daun ubi because I started chatting up a guy who looked like he was Malay, and in his plastic bag were two bundles of daun ubi. He turned out to be Indonesian and he was buying stuff because tomorrow is the start of Ramadan. The vegetable vendor where the Indonesian fella bought his daun ubi had sold out all the daun ubi she had. But I found another vendor, with the help of this Indonesian fella, further down the aisle who had some. As soon as I got home, I started preparing the daun ubi. I plucked the leaves, washed them and used my mortar and pestle to pound them. 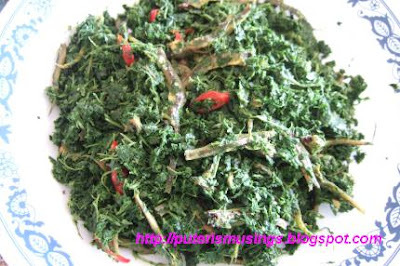 I stir fried the daun ubi with chopped garlic, thinly sliced ginger, sliced chilli, some ikan bilis and seasoned the whole thing with salt and pepper. Yummy! :-) I wished I had more than just a bundle because then I could have made chicken with daun ubi with santan - masak lemak. Maybe next week, eh.